NRW is the most highly populated state in Germany and we’re trying to reach as many writers as possible to see how we can support each other. 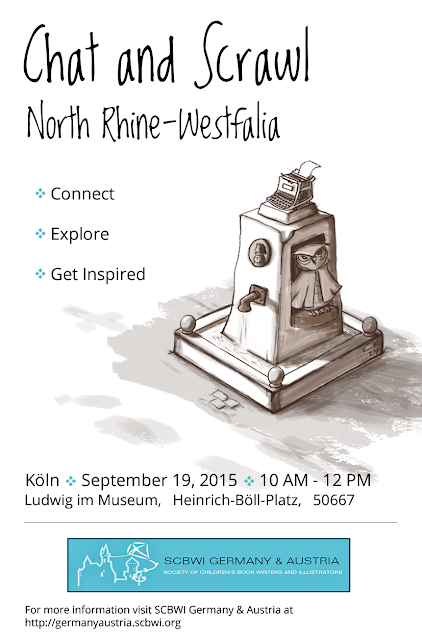 Please join us for a morning of conversation and creativity in Cologne in an inspirational atmosphere. All writers, illustrators and SCBWI members are welcome to this first stop on the SCBWI tour of central Germany. Let’s discuss our current writing and illustrating projects, share goals for the new year, discuss ideas for our future gatherings and, finally, spend some time tapping into our creative minds with some focused scrawl time. Bring a current project you are working on or use the time to develop new ideas. The Ludwig is the coffee shop in the museum. Fee: No cost, but bring money for drinks/food if you desire. Thanks to illustrator Corinna Kochendoerfer for our iconic image!